"I see the list of stations, but every time I try to connect to one, I get a "Connect attempt failed" message after 30 seconds. What's the problem?" Most likely, a "firewall" problem is preventing your computer from receiving messages from other stations over the Internet. This is a very common issue. Please note that this is not a problem with the EchoLink software itself. For this reason, the EchoLink Support team will not be able to help you solve it. However, the information on this page might help. 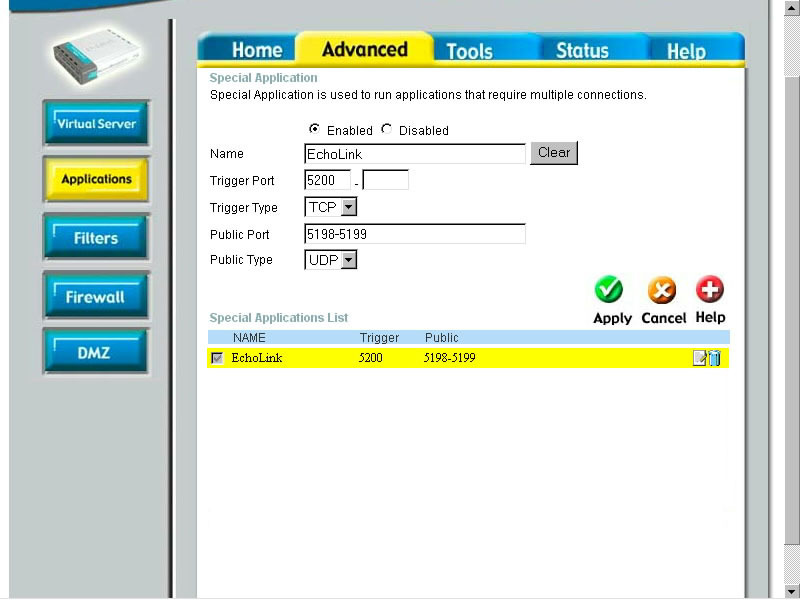 It's also recommended that you first try the Firewall/Router Test function from the Tools menu in the EchoLink software. The solution depends on what kind of hardware and software you are using for your Internet connection. Unfortunately, many different hardware and software products may be involved, so it is not possible to document every solution. A few of the most common situations are listed below. EchoLink requires that your router or firewall allow inbound and outbound UDP to ports 5198 and 5199, and outbound TCP to port 5200. If you are using a home-network router, you will also need to configure the router to "forward" UDP ports 5198 and 5199 to the PC on which EchoLink is running. Note: If you are using Internet security software and have recently upgraded to a newer version of EchoLink, you may need to re-apply the special security settings you had established earlier. If you connect to the Internet using DSL or Cable Modem service, there might be a router built into the equipment that the telephone company or cable company provided you. For example, some of the equipment provided by BellSouth and Verizon have built-in routers. Check the make and model of your DSL adapter or cable modem, and then look for instructions on the portforward.com site described below. Newer versions of Windows come with a built-in "firewall" feature that helps protect your computer from undesired connections from the Internet. In order to use EchoLink, you will need to adjust some settings if the built-in firewall is enabled. Windows XP Service Pack 1: See Windows XP Firewall Setup. Also see the Microsoft article Using the Internet Connection Firewall. Windows XP Service Pack 2: See EchoLink and Windows XP SP2. Windows 7 and Windows Vista: See EchoLink, Windows 7, and Windows Vista. Problems With Some Connections, And Not Others? If you router isn't properly configured, you might that you are able to connect to some stations on EchoLink, but not others. For more information about this, please see the article "Echolink, Firewalls, and Routers." Several versions of Microsoft Windows support a utility called Internet Connection Sharing (ICS). This utility allows several different computers on a local network to access the Internet over a single connection. Basically, ICS is a software-based router. 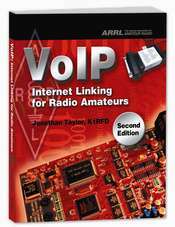 As with any router, the software must be configured to "forward" UDP ports 5198 and 5199 to the computer on which EchoLink is installed, which might not be the same computer on which ICS is running. See also the Microsoft articles on troublehooting ICS problems and a description of ICS. Windows 95, 98, and Me: From the Start menu, choose Run, and enter winipcfg. The IP Configuration window should open. In the drop-down box at the top, select your Ethernet adapter, then note the IP address that is displayed. Windows NT, XP, 2000, and 2003: From the Start menu, choose Programs->Accessories->Command Prompt. A command prompt should open. Enter ipconfig. Note the IP address that is displayed underneath the name of your Ethernet adapter. Be sure you are using the latest version of the firmware for this device. The version of your current firmware is displayed on the Setup page. Check the Linksys Web site for details. In the first pair of Service Port Range (or Ext.Port) boxes along the top, enter 5198 and 5199. On the same line, under Protocol, choose UDP (or check the UDP box). On the same line, enter the local IP address of the computer running EchoLink. (If you are not sure what the address is, run "winipcfg" or "ipconfig" from a command prompt). If there is an Enable check box on the same line, check it. Be sure you are using the latest version of the firmware for this device. Older versions of the firmware may not work correctly. Check the D-Link Web site for details. After Trigger Port, enter 5200. After Trigger Type, choose TCP. After Public Port, enter 5198-5199. After Public Type, choose UDP. Log into the Router by going to going to http://192.168.2.1:88 on your browser, then invoke Initial Setup, then go to Virtual Server under the Security Banner. In general, the router must be configured to "forward" UDP ports 5198 and 5199 to the computer on which EchoLink is installed. Forwarding is sometimes found as an advanced configuration option on your router's setup screens. If forwarding is not available, you may need to configure your EchoLink computer as a DMZ, which effectively opens all ports to the Internet. If this becomes necessary, some sort of network security software such as Windows XP, Norton Internet Security, or ZoneAlarm is recommended. ZoneAlarm is a brand of security software which can act as a firewall, blocking certain "ports" from being used, unless you configure it to allow them. If you are using the "free" version of ZoneAlarm, you will need to change the Internet Zone Security slider to Medium while you are using EchoLink. Other versions of ZoneAlarm (such as ZoneAlarm Plus and ZoneAlarm Pro) let you set more specific rules while leaving the security level at High, which is preferred. For more information, see ZoneAlarm Configuration. The Norton Internet Security package includes Norton Personal Firewall, a software-based firewall. Setting up Norton Internet Security for use with EchoLink is normally almost automatic. For more information, see Configuring Norton Internet Security. If you are using DSL to connect to the Internet, note that many DSL "modems" have built-in routers. For example, Sprint DSL customers are frequently provided with Efficient Networks or ZyXEL modem/routers, even though the outside of the equipment might only say Sprint. If you have such a unit, please follow the modem's User Guide to forward UDP ports 5198 and 5199 as described above, or contact the router manufacturer or your DSL provider for assistance. Although EchoLink is designed to run only under Microsoft Windows, some Macintosh users have successfully run it in a Windows "virtual machine", using the VirtualPC product from Microsoft. However, due to EchoLink's UDP port requirements, VirtualPC must be configured to use an IP address separate from the Mac itself. This can be easily done if your home network uses a router. 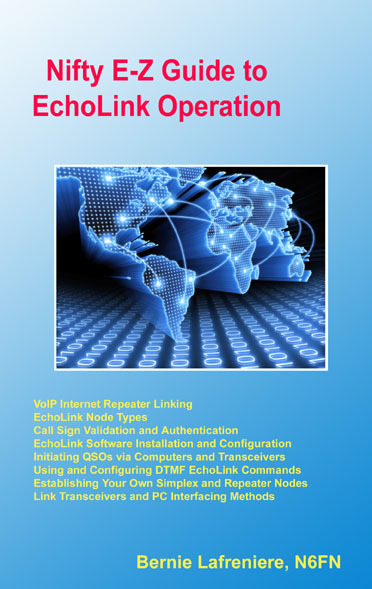 Configure the router as described above to forward EchoLink's UDP ports to the second IP address. See the VirtualPC documentation for configuration details.